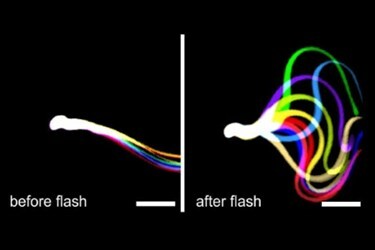 For the first time, the function of sperm has been controlled by optogenetic processes. By inserting a light-activated enzyme into mouse sperm, researchers from the Max Planck Society turned previously sterile mice into fertile ones. This work illustrates how optogenetics can be used outside the area of neuronal cell research. Controlling cells in a way that doesn’t interfere with their natural processes has been a goal of researchers for some time. The search for a way to switch cells on and off was realized when German researchers figured out how to insert light-sensitive proteins into the membranes of cells. The proteins, originally from green algae, were also ion channels, which enabled the light-based control of cellular behavior across the cell membrane. This new area of research is called optogenetics, and it is rapidly expanding. Since its inception, optogenetics has been largely confined to neural cell studies, but now it has moved into other cell types, according to a recent press release. As optogenetics has advanced, it has branched out to other cellular pathways, like those used in cellular signaling. One of these is cyclic AMP (cAMP), which is involved in the function of many organ functions, including heart rate, the sense of smell, memories, learning, and fertilization. To fertilize eggs, sperm cells require cAMP to be synthesized, which allows them to swim, according to the press release. In the absence of a key enzyme, adenylate cyclase, sperm cannot swim. In this particular case, the mouse sperm lacked this enzyme, and they were infertile. To remedy this problem, the Max Planck researchers designed a new light-activated adenylate cyclase (bPAC), which was then genetically inserted into mice. At first, the sperm from the genetically modified mice were not able to swim. After exposure to blue light, however, the bPAC was stimulated to generate cAMP, and the sperm become motile. While the researchers were interested in seeing that motility of the sperm was increased, their interest extended even further, according to the press release. Their goal was to control fertilization by using the light-based stimulus. After insertion of bPAC, the sperm were stimulated to swim, but, more importantly, they were able to fertilize eggs in a normal way. As interest in optogenetics continues to build, research is focused on expanding the capabilities of the method. Recently, researchers from MIT developed different types of light-sensitive proteins so that stimuli can be created to react to more than one color of light. Previously they only reacted to blue-green wavelengths.